Yes, I finally did it. 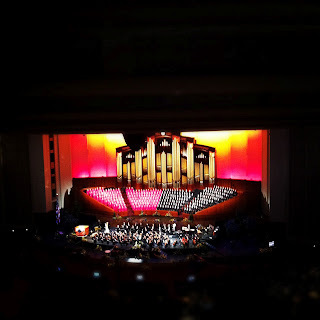 I saw the Mormon Tabernacle Choir in concert. 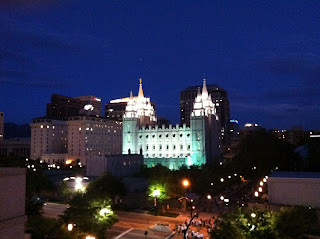 I've been here in Salt Lake City almost two full months and almost went without hearing the choir. It is the quintessential thing that everybody recommended to me before coming here: "You have to hear the choir." This includes non-choral people. It was not due to a lack of trying. My very first Sunday here I actually woke up early to attend their Sunday morning service, but upon arriving at the train on campus... I found out that they didn't start running until after the service was over. Alas, I was stranded on campus for Sunday morning service. Thus, I knew there was no way I could get to a Sunday service unless I did a one hour walk downtown from the campus or found somebody with a vehicle who might be interested in seeing the choir. The choir also has Thursday evening rehearsals open to the public but I don't often stay out late on a weekday, at the risk of being stranded, yet again, by public transit. The woes of a student without a car. However, after a group homework session on Saturday, a bright classmate of mine decided to look up Sunday service information for the choir. 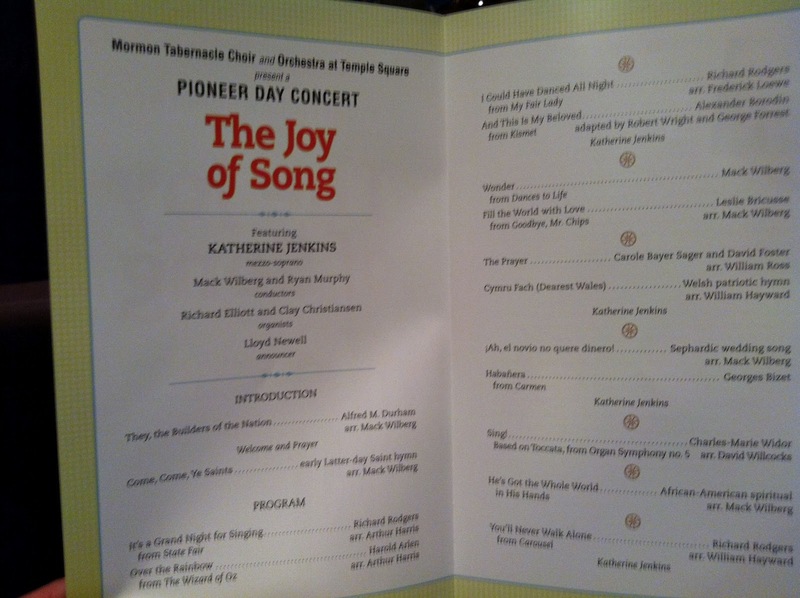 Instead, she found that they were actually singing in a free Pioneer Day concert (the day the Mormon pioneers arrived with Brigham Young in Salt Lake City) that very evening. Doors opened at 8 PM and there would be standby tickets available. We looked at our watches. It was 6:45 PM. We had time to get downtown. I frankly would prefer to see the choir tackle some sacred and secular repertoire on a significant religious holiday. I like to see how Mormons celebrate. My friends and I piled into the Conference Centre which can seat over 21,000 people. In the summer, the choir performs and rehearses in the Conference Centre instead of the Tabernacle due to the summer tourist crowds. It definitely was the largest church building I have ever been in. While the concert was not sold out, there were only a few seats available in the outermost sections. When we arrived at the Conference Centre the lines were so huge that we had to snake throughout the courtyard and garden planters before we could even enter one of the numerous doors to pass through metal detectors. My first thoughts upon seeing the Mormon Tabernacle Choir: They look so uniform. It's almost as if they were sorted according to height in each of the rows since the level of conformity was unparalled. 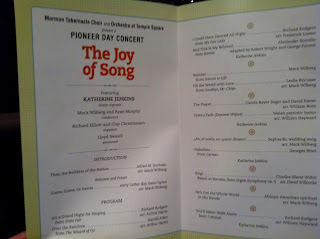 Their program had lots of listener-friendly pieces with Welsh soprano, Katherine Jenkins, leading the way. I found the acoustics in the Conference Centre kind of strange because even though I was looking at the choir, all I could hear was this muffled speaker sound radiating towards me. While I'm sure they were amplified, it was unfortunate I couldn't hear more of what they sounded like. They didn't have the power and oomph I imaged from a choir that large. There was some breathy blend going on and I'm not sure if that's what they were doing or what was being broadcast to me. They posted a Youtube video of the entire performance and they sound much clearer on the video. What was impressive is that they did the entire concert memorized. As well, the concert was filmed for national and national TV broadcast so camera crews pan throughout the choir and settle on particular faces. I can only imagine the stress of possibly being video recorded at any given time throughout the performance. All I can say is, singing isn't the prettiest when you try to capture it in still form. There's a lot of vowel modification, lip postures etc. it's easy to snap a picture when somebody not looking their best. The soloist Katherine Jenkins sang a large range of popular music from "I Could Have Danced All Night" and "The Prayer." And throughout it all she maintained a very dark resonant space with extreme lip postures. Take a look at the Youtube video and you can probably see and hear what I mean. I have to say, it's nice having a video to share with you all since you can see the exact performance I watched in Salt Lake City. Overall, it was quite an experience to hear the choir with their high-tech set-up and in their massive Conference Centre. 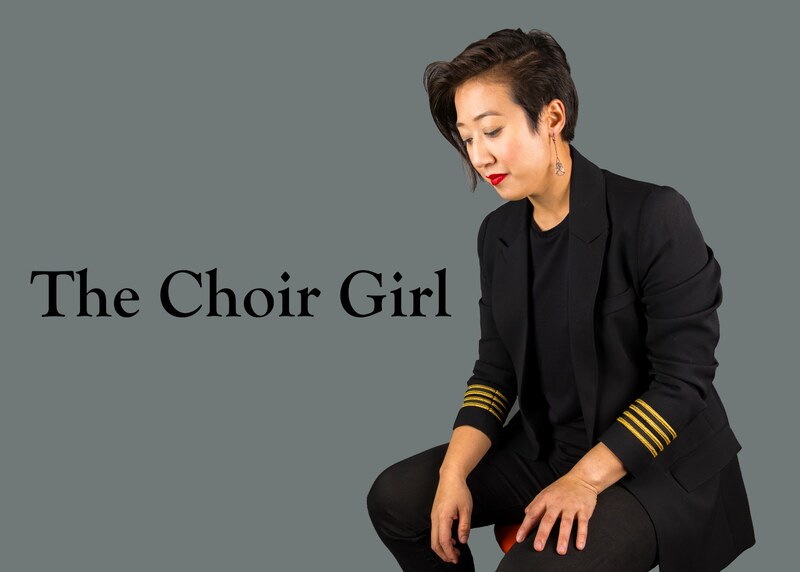 I was told that all the choir members of the Mormon Tabernacle Choir are unpaid and one can tell there is a high level of musical proficiency throughout the group. It was staggering to see the thousands of audience members attending a cultural event. It's not every city you can get that many people attending a live concert produced by locals. Thus, I can finally leave Salt Lake City with the knowledge that I was able to hear the famous Mormon Tabernacle Choir. Thank-you for the links! I am heading out on Wednesday but I will look you up if I'm ever back in town! Thanks for reading my entry.